Sen. Aisha Alhassan, Minister of Women Affairs and Social Development, on Saturday said the Chibok girls were ready for academic session in September and pleaded with abductors to release the remaining girls. Alhassan disclosed this during a lunch with the released Chibok girls and their parents in Abuja. “They will be examined academically and placed appropriately, the ones that are qualified to enter into the university will be allowed to. 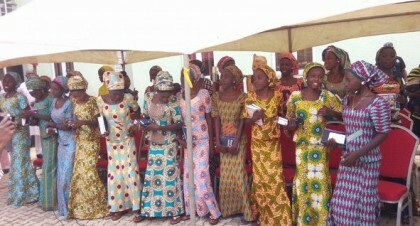 “The American University, Yola had indicated interest in supporting 21 of the Chibok girls. “We are also meeting with the university to support the remaining girls so that they all can be in one place,” she said. Alhassan said that the escaped 14 Chibok girls, who were released three years ago were given scholarships by the American University of Nigeria, Yola. She said that the girls were properly examined academically, adding that they started a foundation courses for them. The minister, however, pleaded for the release of the remaining Chibok girls and others in captivity, adding that the abductors should dialogue with government. Mr Reginald Briggs, the Assistant Vice President of America University, Yola, said the girls were initially traumatised but had made significant progress. “We have 24 of the Chibok girls with us, we try to keep their academic levels up by assessing them emotionally, psychologically, academically and we found out that they are at different academic levels. “They have foundation in English, Mathematics and General Knowledge and gradually we moved them to advanced stage. “They are studying difference courses such as journalism, computer science, accounting and law,” he said. Briggs said that the university was working toward supporting the 82 Chibok girls to be enrolled into the university. The Chairman of the Chibok Girls’ Parents, Mr Yakubu Nkeki said that parents of the girls were happy meeting their children and appreciated the efforts of the government. Mrs Catherine Udida, the Head of the Preventing and Countering Violent Extremism, Office of the National Security Adviser, said that the Chibok girls were fit psychological as they had gone through various tests. She said that the girls were fully integrated, adding that initially they were shy but they now have confidence and ready to face the world. One of the Chibok girls, Miss Rhoda Peter appreciated the efforts of government and well-meaning Nigerians who had supported them.